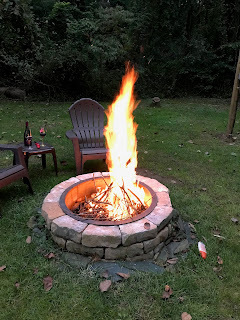 I am working on finishing the wood burning fire pit that was started last year. It has been in the yard now and used during the Spring and Autumn to create toasty warmth while still enjoying the outdoors. Last evening, Chris and I sat around a roaring fire enjoying the heat while beginning to reduce the size of the piles of wood from the Ash trees that were recently felled. 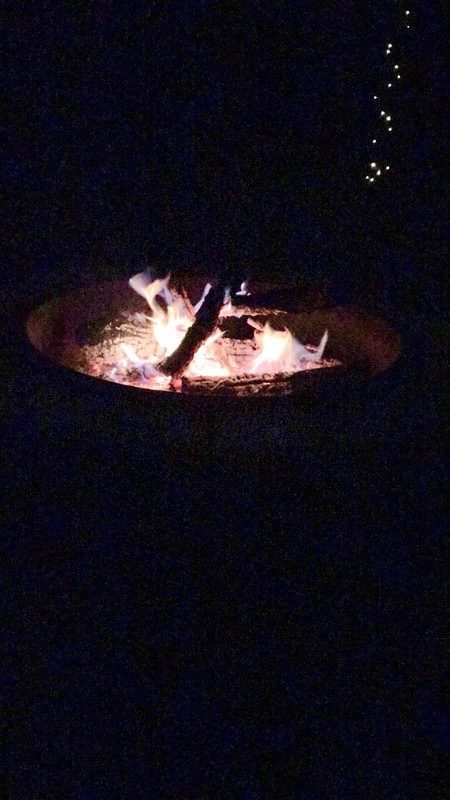 It was a great fire on a great evening. Although one is barely visible on the right side of the image, there are now four posts outlining the boundaries of the area that will comprise the new and improved permanent setting for the fire pit. In the darker image, the lights wrapping the post are visible as small points of light. Today, I hope to get the lights installed. We have purchased outdoor lights to suspend from the posts to further illuminate the area. Chris has a vision and I am working to bring that vision to reality. I hope the fire pit will become a regular gathering place during the seasons when the pool is closed.